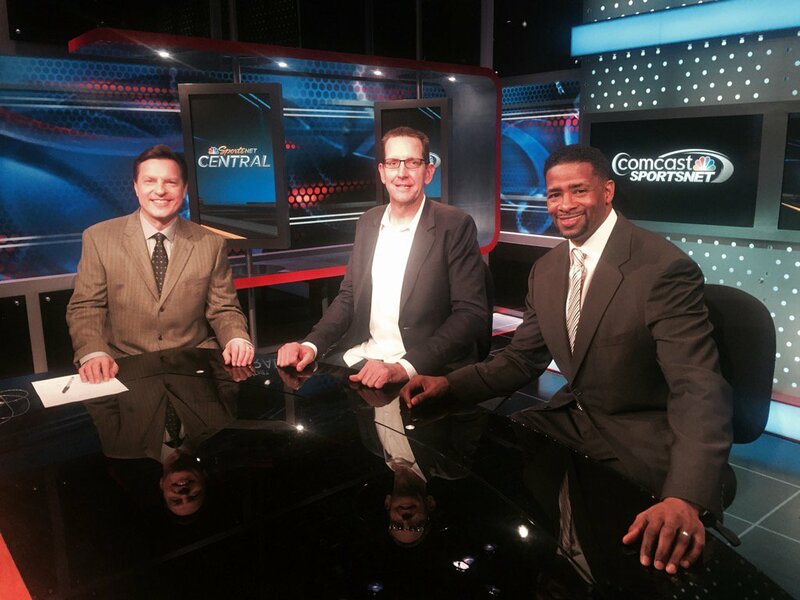 Editor Ashley Wijangco speaks with former Chicago Bull and current Comcast SportsNet Chicago Bulls analyst Kendall Gill about his return to CSN, how the Bulls’ season went and what his predictions for the NBA playoffs are. Kendall Gill had a 15-year NBA career after his four years at the University of Illinois at Urbana-Champaign. Gill was taken as the No. 5 overall pick in the 1990 NBA Draft. He played for seven different teams over the course of his NBA career, spending the 2003-04 season with his hometown Chicago Bulls — Gill went to Rich Central High School in Chicago’s south suburb Olympia Fields. Bulls fans are most recently familiar with Gill’s work as a pre- and postgame analyst for Bulls games on Comcast SportsNet Chicago. He started the gig in 2007 but was suspended in Mach 2013 after getting into a physical altercation with Tim Doyle, formerly of Big Ten Network. Gill wasn’t brought back after his suspension was up; however, CSN recently brought him back in December to join Mark Schanowski, whom he worked with before, and Will Perdue. The Bulls Charge had a chance to speak with Gill over the phone Sunday to talk about the Bulls and the NBA playoffs. Ashley Wijangco: You returned to CSN back in December, so what was it like to be back after having been gone for such a long time? Kendall Gill: It was great! It’s a job that I loved, and due to unfortunate circumstances, it was a job that I had to leave for two and a half years. But it was great to have the opportunity to come back and do the job that I love. And the one thing that I say I missed most is not so much being on TV. The thing that I missed most is being part of a team — like with Mark Schanowski, Will Perdue and all those guys. That’s what I missed most…because when you retire from pro basketball as I did, you miss the team concept. And that’s what I missed most when I had my sabbatical — as I say — from CSN. AW: The Bulls are done since they had a less than ideal season. But what were your expectations for the Bulls coming in, and what do you think of how things turned out for them? KG: My expectations were that they would be in contention for the Eastern Conference Finals with the Cleveland Cavaliers. That did not happen for various reasons. I think that Fred Hoiberg, in his first year, had some difficulties in adjusting from college to pro. Then you have a host of injuries: Joakim Noah…separating his shoulder and had to go out for the rest of the season. Derrick Rose broke his eye orbital (bone) at the beginning of the season and also some injuries here and there. Derrick really didn’t get started until after the All-Star break. Also, I think there were a few chemistry issues. The defense was not what it used to be under the Tom Thibodeau-era. I thought that they had to get back to that in order to become contenders. And I think that, over the summer, there’s going to be some major overhaul in the Bulls organization. So we have to wait and see what they’ll get. AW: Do you think Pau (Gasol) is done in Chicago, or should be done? KG: Everything’s on table for Chicago. I don’t know what is going to happen. I feel like they’re going to make a lot of different moves. Pau may be back. He may not be. It all depends which direction the Bulls want to go, and I think that Pau is going to carry a heavy price tag. He already gave the Bulls a discount of $7 million a year. When he signed the contract, he thought he was going to come here and compete for a championship. That didn’t happen, so I think that he’s looking to get paid now as opposed to giving teams a discount. AW: What did you think of Derrick and Jimmy (Butler) playing alongside each other? Because I know there a lot of people who think they can’t really coexist and that they didn’t really work well (together) this season. KG: If you’re a good player, you learn to adapt to anyone. And I do believe that Derrick Rose is the best player on this team, the way that he can command and take over a game at any time. Jimmy can do that at times; however, I think there is a pecking order. … I think once they figure that out — their dynamic — then, they’ll be able to play together. AW: Around the trade deadline, Kirk Hinrich got traded. … But I know Kirk Hinrich was your rookie when you were on the Bulls, so what was it like seeing him get traded to Atlanta, especially because it was so unexpected? KG: It was tough because Kirk has given so some much to the franchise. I think that Kirk is in the final years of his career. I know that he kept his here home in Chicago, and he probably wants to continue to play here. But that’s the nature of the season: You never know what’s going to happen or when a guy is going to get traded. It’s unfortunate that Kirk was traded. It’s just the nature of the business. I wish him well. I hoped that he could have finished up here in Chicago, but that just didn’t happen. AW: What are your playoff predictions? Do you think the Warriors are actually going to go all the way? KG: Yeah, I think it’s going to be a repeat of last year. I think they’re going to go up against the Cavaliers to compete in the championship. When they get there, I think that Cleveland’s going to win it this time. AW: Why do you think Cleveland is going to be able to pull off the win this time as opposed to last year? KG: Because they’re healthy, and they have Kyrie Irving and Kevin Love in the lineup…J.R. Smith is playing well, and they’re moving the basketball when they need to. When teams don’t move the basketball, Golden State will beat you each and every time. But when you are moving the basketball and play just a little bit of defense, there are a lot of opportunities to beat the Golden State Warriors. AW :What’d you think of the Warriors beating the 72-10 record by the ’95-’96 Bulls? KG: I thought that record would never be broken. But you need help, you need luck, and the Golden State Warriors had all of that this year. I think it was great for the sport because everybody was watching them to see if they could break record.